Hand-crafted in the United States, Fire Pit Art fire pits are constructed with durability and creativity in mind. The Third Rock fire pit is three feet wide for a large viewing area from any angle or height. 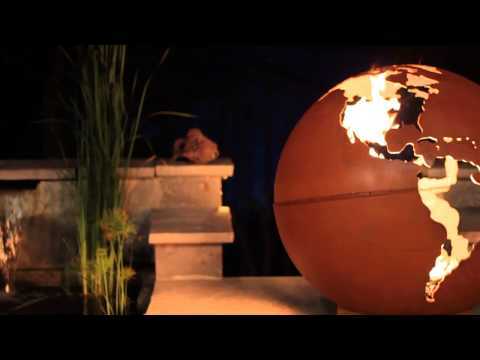 The unique globe design displays the fire through the continent-shaped cut-outs and is constructed from heavy duty 1/4-inch thick carbon steel to make it one of the most durable steel fire pits on the market. The inner bowl is coated with a paint that is resistant to high temperatures, while the outer side has a maintenance-free, iron oxide patina that will darken over time. A drain in the middle allows rain to escape to prevent rusting. Each fire pit is unique and is individually numbered by the artist on a brass plaque, so you know you are getting a one-of-a-kind piece. This is such a fine piece of art. A conversation piece! !